Artful Gathering online art retreats for 2016 is getting ready for their summer events with a 'pre-season' blog hop that will help you get to know their instructors (and maybe win a prize!) Each week, meet an instructor, visit their site and view their video portfolio ~ and pick up a secret word somewhere on their page! Collect all the words by May 1st ~ when unscrambled, they will form an inspirational quote by a famous person. Find out more about how to join in at the ArtfulGathering site! 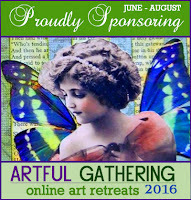 Lunagirl is a proud sponsor of Artful Gathering online art retreat again this year! They are working now, Michele. Thanks for letting me know!